Application Deadline: Friday 22nd September, 2017 12:00 pm CET. 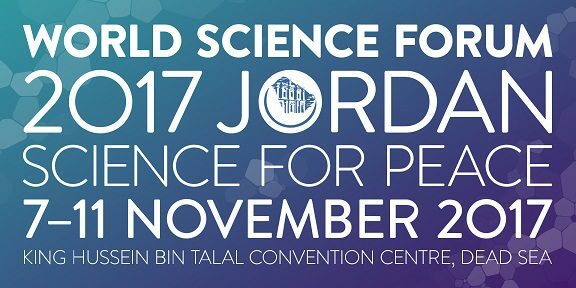 After the highly successful 2015 World Science Forum held in Budapest, Hungary, the Royal Scientific Society of Jordan will host the 2017 biennial event themed ‘Science for Peace’. Organising partners include the Hungarian Academy of Sciences (MTA); the United Nations Educational, Scientific & Cultural Organisation (UNESCO); the International Council for Science (ICSU); the American Association for the Advancement of Science (AAAS); the World Academy of Sciences (TWAS); the European Academies Science Advisory Council (EASAC); the International Social Science Council (ISSC) and the Inter-Academy Partnership (IAP). Hosted at the King Hussein Bin Talal Convention Centre, located at the lowest point on earth on the shores of the Dead Sea, WSF 2017 is expected to be the largest event in the series so far, with over 2,500 delegates from approximately 100 countries. The over-riding aim of WSF 2017 is to create the first scientific open forum in the Middle East to advance global thinking and to support action on critical issues such as: Energy and Water; Food; Climate Change; the Alleviation of Poverty and Inequality; Cultural Understanding Between Peoples and the Creation of Wealth and Opportunity Within All Societies. WSF 2017 also serves as a significant G77 Sustainability Update meeting around World Science Day for Peace & Development as we engage the world of science and redefine the global potential of scientific communities and policymakers to bring real change to our interlinked societies. To further encourage this, SciCom – Making Sense of Science and the Royal Scientific Society of Jordan will jointly facilitate the attendance of up to 25 international science journalists at WSF 2017. (Note that media can request WSF participation at their own expense via the online registration pager). The open call for applications is being coordinated with the World Federation of Science Journalists, a not-for-profit, non-governmental organisation, representing 55 science journalists’ associations of science and technology journalists from Africa, the Americas, the Asia-Pacific, Europe and the Middle East. a lump sum of maximum €350 towards proven travel costs. Journalists, irrespective of their gender, age, nationality, place of residence and media (paper, radio, TV, web) are welcome to apply. Media accreditation will be required. On submitting an application form for travel grants, candidates agree to the full acceptance of the rules and to the decisions taken by the Selection Committee. The deadline for submitting an application is Friday 22nd September, 2017 12:00 pm CET. i have particular interest to take part in your program regarding the world science forum 2017. -Provision of a one page event report in English and completion of a feedback questionnaire regarding the scheme. while waiting for your respond consider that i particularly want to take part in your 2017 forum for if the initiation can be in my country to widen your efforts and safe the world better.